The X-38 Crew Return Vehicle (CRV) was a prototype wingless lifting body reentry vehicle to be used with the International Space Station (ISS). 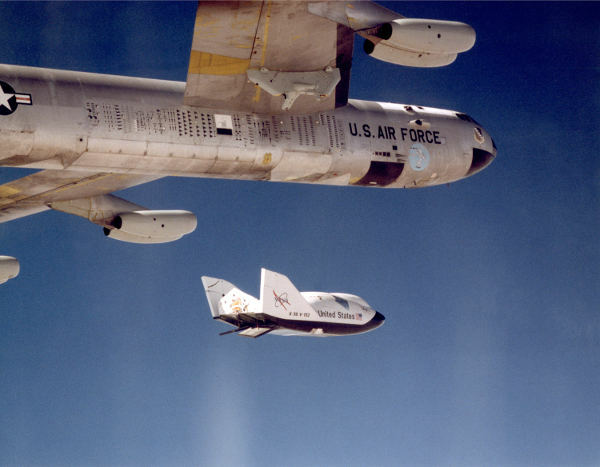 This picture shows a test from 1999 where the X-38 CRV was dropped from one of the wing pylons of NASA’s B-52 mothership aircraft (tail number 008 and in a role very atypical of the BUFF) based out of the Dryden Flight Research Center. Two full and one partial X-38 prototypes were built before development of this CRV was cancelled in 2002.